Developing countries should be supported and assisted to join the World Trade Organisation (WTO) as early as possible, said the First Deputy Minister for Foreign Affairs, Le Cong Phung at the general debate of the 61st United Nations General Assembly in New York on Sept. 25. Mr. Phung said: " It should be pointed out that developing nations' increased integration in the world economy is indeed an important element assuring the achievement of the Millennium Development Goals (MDGs)." He also expressed concern with the increasing adverse impacts of globalisation. He said "the failure of the Doha Round, the strengthening of protectionism in a number of developed countries, the fluctuating prices of oil and gold, are causing more and more difficulties for developing nations in their efforts to achieve their MDGs." He used a typical example for this situation, that is, the anti-dumping tariff imposed on Vietnamese catfish and shrimp in the past year, and presently on footwear, which has been affecting the life of millions of poor people. He stressed: "This measure goes counter to WTO rules and the spirit of trade liberalisation pursued by Member States." He continued: " Non-tariff barriers under the disguise of, among others, hygiene and safety standards should be removed to facilitate access to developed economies' markets," adding that at present embargo and sanctions are completely obsolete policies. He also called for an early lifting of the unilateral economic and trade embargo against Cuba. He said that peace and socio-political stability are indispensable for development, and reaffirmed Viet Nam's strong support for efforts to reach early peaceful settlements of international and regional conflicts and differences, including nuclear issues on the Korean Peninsula and Iran, and the crisis in the Middle East. He said: " I wish to state Viet Nam's consistent policy to support the just struggle for the inalienable rights of the Palestinian people and call on parties concerned to implement the UN Security Council resolutions on the Middle East, including Resolution 1701, and soon arrive at a fair and lasting solution for peace and stability in the region." "Viet Nam is deeply concerned with surging terrorism in the world. We will continue to support joint efforts of the international community to combat terrorism on the basis of the fundamental principles of the UN Charter and international law as well as respect for national sovereignty. The deep roots of terrorism, including poverty, inequality and injustice, must be eliminated." Deputy Minister Phung affirmed Viet Nam's support to efforts to strengthen multilateral mechanisms, in which the UN should play a central role, with a view to building and ensuring a peaceful and stable environment in the world. " The United Nations should be reformed to improve its effectiveness, democratization, and modes of operation on the basis of the fundamental principles enshrined in its Charter," he said. He emphasised that Viet Nam has made remarkable progress in implementing the MDGs and is able to meet the 2015 deadline. 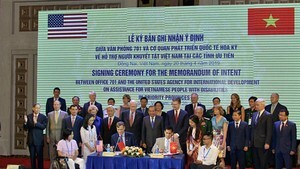 To conclude, the Vietnamese official reaffirmed Viet Nam will continue its foreign policy of sovereign independence, peace, cooperation and development to be a friend and reliable partner of all countries in the international community, and wished that the country would receive continued support from other member countries.